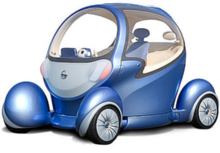 Imagine an egg balanced on a roller-skate and you're not far off picturing Nissan's Pivo 2 concept car, set to go on display at the Tokyo Motor Show later this month. It's a development of the first Pivo concept, shown in 2005, and both cars share a party-piece. They can turn around without moving a wheel. Both Pivo 1 and 2 exploit full drive-by-wire technology to divorce the mechanicals from the controls, removing the need for anything other than an electronic link between the steering wheel and the driven wheels. The result is that the entire passenger compartment can swivel, like a tank's turret, through 360 degrees - while the wheels, motors and other grubby bits stay motionless beneath it. And this of course means that the Pivo drivers don't need to learn how to reverse – going backwards is a case of spinning the cabin and going forwards. Pivo 2 makes it even more simple to park by featuring individually swivelling wheels with hub motors, allowing the car to make like a crab and scurry sideways into difficult parking places - a trick shown off by Toyota's Fine-X car at the 2005 Tokyo show. The interior shows just as much innovation. Beyond the labelling silliness is a cute Robotic Agent, which sits in the dashboard like R2-D2 nestled in the back of an X-Wing. 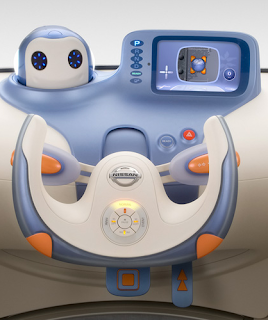 Rather than unintelligible bleeps and whistles, this robot offers cogent advice to the driver. There's a lot to like here. Will it reach production? Alas – for all those who struggle to park while peering over a shoulder – probably not soon in this format.